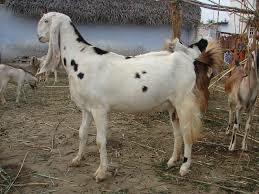 Sojat is quite famous for its white color and beauty, the goat of a sojat breed is found in Rajasthan province. Due to being similar to Jamunapari in this view, in many places it is considered as a Jamunapari. Sojat, Aau, Pipar, and Jodhpur in Rajasthan are found in some places, due to the found in the Sojat district, the name of this goat's breed has been called Sojat.Sojat goat is considered suitable for the production of meat, soot meat is very tasty, hence this breed has a lot of demand, more demand for this breed is due to its delicious meat.